Bluebirds appear in the Methow Valley during spring, when it’s time to plant our crops. They stay here for the growing season, and take off around harvest time.For us, bluebirds are a reminder that every single thing we do as farmers is connected to—and impacts—the environment at large. We believe that nutritious food produced from nature is the cornerstone of a healthy community. And we take pride in making great food available to our friends, our neighbors, and you. 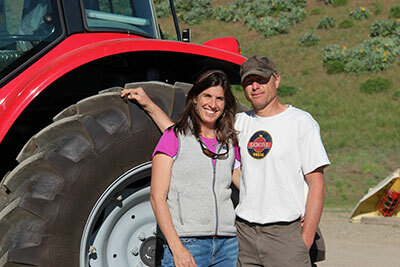 Brooke and Sam Lucy met while walking their dogs on a Methow Valley road years ago, within sight of the scenic spot where the Bluebird granary stands today. Bluebird is a family business that was started in 2005. 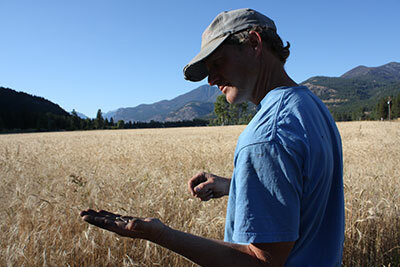 Brooke and Sam saw a niche for growing and processing ancient grains. Now, Emmer and Einka have become their signature grains and Brooke and Sam have set the gold standard for nutrient dense whole grains, fresh milled flour and dry product blends. Sam does most of the farming and oversees the granary and mill. Brooke manages PR, sales and packaging. Daughter Larkin bakes the emmer cookies for tours. Daughter Mariah is chief of floor sweeping. Our small and wonderful staff, C.J., Tiffany, Sheah, Kevin, and Brad do all the rest!